The Association was founded in 1993, offering membership to former `Vindi Boys` and sea school staff. Its purpose is to enable men to rekindle memories of that period of their young lives and to make contact, where possible, with former friends and shipmates. It is believed that in the region of 70,000 boys passed through the Sharpness establishment and the Association has found so far 5000. About 2,700 have joined the association, spanning 17 countries, the majority live in the UK but there are branches in Australia, New Zealand and Canada. The annual reunion, which is held at Sharpness, attracts several hundred members each year. Many camp (tents & caravans) in the field below the Dockers Club or book into one of the many local hotels but beds get booked up year after year very quickly. The 2 day programme includes a church service on both days, tea and tabnabs on the church lawn on Saturday, evening entertainment both days, a slide show of ships once knew, and much more; but it is mainly about memories and `swinging the lamp`. Wives, of course, are very welcome, and many attend. Brief history of the ship 'Vindicatrix'. 1893 - The Vindicatrix started her life as a fully rigged ship the Arranmore, built in Glasgow. 1903 – she was wrecked at Algoa Bay, ashore for 5 months then towed 6800 miles to the Clyde. 1910 - sold to H. Folsch & Co (Hamburg, Germany) and renamed the Waltraute. 1913 – dismasted and became Hamburg Seaman’s Mission and later a German naval submarine crew’s rest ship. 1920 – surrendered at the end of WW1. 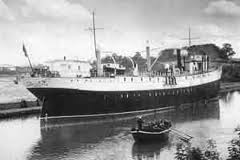 1939 to 1966 – as WW11 loomed she was towed to Sharpness and moored in the Old Arm at Sharpness and commissioned as the National Sea Training Ship to provide a base for training boys as deck hands and stewards for the merchant navy. The courses lasted two or three months, and boys received their basic training here. The ship was the schools only accommodation, but later a camp of huts were built nearby, and then the ship was primarily used for tuition. Life on board was made a close reproduction of the conditions of sea service, with watches kept night and day, time signaled on the ship’s bell and navigation lamps trimmed and lighted. The boys were taught ropework, boat handling, signaling, knowledge of the compass, cleaning and serving in the mess. When they left at the end of the course, they were found employment on a ship. Most of the boys came straight from leaving school, and for many it was their first time away from home. They found the life very hard, but they acknowledge that their short stay on board rapidly turned them into young men. After providing training for around 70,000 boys over a period of 27 years, the Sea Training School at Sharpness closed at the end of 1966. A few weeks later the Vindicatrix was towed away by the tugs Primrose and Addie and was taken to Cashmore's yard at Newport to be broken up.